Each year I cook corned beef, cabbage, and scones with the children I care for on St. Patrick’s Day. But this year I wanted to try a new Irish dish. This speedy stew simmers in less than an hour, is named for the Irish, and can be enjoyed all year round. 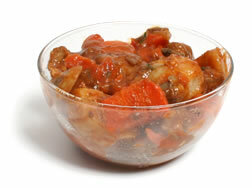 Mulligan stew is a thick soup containing whatever ingredients happen to be on hand when making it. Ingredients generally include meat, potatoes and a mixture of any type of vegetable that is available at the time. In a large skillet sprayed with butter-flavored cooking spray, brown meat for 10 minutes. Stir in tomato soup, water, and parsley flakes. Add carrots, potatoes, onion, and celery. Mix well to combine. Lower heat, cover, and simmer for 35 to 45 minutes or until meat and vegetables are tender, stirring occasionally. What are you making for St. Patrick’s Day with your charges?